This study was conducted to determine whether surficial geochemical methods can be used to identify subsurface mineral deposits covered by alluvium derived from surrounding areas. The geochemical investigation focused on an anomalous geophysical magnetic high located in the San Rafael Valley in Santa Cruz County, Arizona. The magnetic high, inferred to be associated with a buried granite intrusion, occurs beneath Quaternary alluvial and terrace deposits. Soil samples were collected at a depth of 10 to 30 centimeters below land surface along transects that traverse the inferred granite. The samples were analyzed by inductively coupled plasma-mass spectrometry and by the partial-leach Mobile Metal IonTM method. Principal component and factor analyses showed a strong correlation between the soils and source rocks hosting base-metal replacement deposits in the Harshaw and Patagonia Mining Districts. Factor analysis also indicated areas of high metal concentrations associated with the Meadow Valley Flat. Although no definitive geochemical signature was identified for the inferred granite, concentrations of tungsten and iron in the surrounding area were slightly elevated. 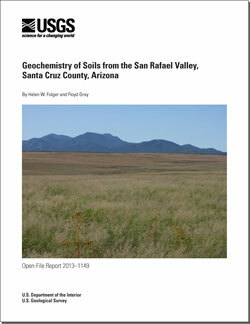 Folger, H.W., and Gray, Floyd, 2013, Geochemistry of soils from the San Rafael Valley, Santa Cruz County, Arizona: U.S. Geological Survey Open-File Report 2013-1149, 30 p., 5 tables, http://dx.doi.org/10.3133/ofr20131149.